Several hundred people showed up in Houston for Governor Palin’s America by Heart book signing. Some waited in line overnight to get their wristbands for the event. The Borders book store on Kirby and Alabama started letting people at 9am and security was very tight. No bags, no jackets, no cell phones and no cameras were allowed. Everything had to be left in your car or at security. Palin was positioned at a table upstairs and she started signing books at 11am. It was a long wait for people like Trina Roberson, who was first in line, getting to the Borders book store yesterday at 5pm. Some have spent hours in the rain, waiting for wristbands and the chance to see the former vice presidential candidate. One of the most controversial political figures in America, Palin is promoting her new book, “America by Heart.” It’s said to celebrate American values, with a focus on Middle America. Dwayne Roecker started reading the book this morning. “I like the ideas that she is putting forth. I certainly believe in a lot of the things that she does, so I like the book so far,” he said. The former beauty queen turned Alaska Governor turned best-selling author and political commentator is adding a new line to her resume — reality TV star. Her show debuted last week. Her fans say it’s only added to her stardom, which they hope catapults her into the 2012 race for president. This is Palin’s second book tour. Last year she traveled by bus to 35 cities to promote her memoirs. This time her tour is smaller, and she’s playing her strength targeting key Republican states. A sign of what’s to come? It’s possible. You have to have a copy of her book that was purchased at a Borders book store. There is a limit of two books per person. You have to have a wristband to get in. The book store handed out 500 wristbands at 9am. There was not one single protester gathered today. She will wrap up her book tour in her home state of Alaska. The signing was scheduled to begin at 11 a.m. Monday at the store, located at Kirby and W. Alabama, but die-hard fans were lined up as early as 5 p.m. Sunday. The publisher, HarperCollins, said the book is “framed by her strong belief in the importance of family, faith and patriotism” and covers everything from American history and culture to current affairs. HarperCollins said the book will also feature selections from classic and contemporary readings that have moved Palin, including the nation’s founding documents, great speeches and sermons, literature and even some of her favorite songs and movies. Even those fans who spent the night outside the store said getting the chance to meet Palin was well worth the wait. “She’s not only gorgeous, she’s awesome. She’s smart, she’s articulate … I mean, she’s that idol that every woman wishes they could be,” Palin fan Elizabeth Lyman said. KDFW 4 TV also has a video here. In recent weeks, a number of prominent Jewish intellectuals have been publicly praising Sarah Palin. This despite a recent poll, reported by veteran analyst James Besser (Nov. 26), that well-educated Jews appear to be overwhelmingly opposed to Palin. How do we explain this discrepancy? Besser focuses on a recent poll showing Palin with stronger support among voters in general who are “less educated” and “less affluent.” That poll made no reference to Jewish voters, but Besser argues that since Jews are “more educated than the population at large and more affluent,” therefore one may safely assume they oppose Palin too. Let’s recall that pundits made similar assumptions about Ronald Reagan when he was a candidate for the Republican presidential nomination in 1980. Reagan also had considerable appeal among the less educated and the less affluent; surely educated and affluent Jews would support President Jimmy Carter – or so the pundits reasoned. But on election day, the majority of American Jews repaid Carter’s disdain for Israel, his impotence in rescuing the Americans held hostage in Iran, and his mismanagement of the American economy, by abandoning him for Ronald Reagan, the most conservative Presidential candidate of the post-Vietnam era. Reagan received the largest share of the Jewish vote of any Republican presidential nominee in U.S. history. While it is certainly too early to assume that 1980 will repeat itself in 2012, there are signs of growing respect for Gov. Palin’s policies and positions – especially among some of the Jewish intellectuals whom Besser presumes now oppose her.Just two days after the Nov. 2nd elections, Palin authored a 1500-word manifesto, published in the pages of National Review, detailing her strategy to “renew, revive, and restore” America according to free-market economics, energy independence, a strong national security policy and traditional moral values. John Podhoretz, editor in chief of Commentary magazine, immediately hailed the Palin Plan as “brilliant.” It is perhaps no coincidence that his father and predecessor at Commentary’s helm, Norman Podhoretz, had endorsed Palin in the Wall Street Journal in March of this year, and was an early supporter of Ronald Reagan’s presidential ambitions at a time when many of his colleagues also questioned Reagan’s intellectual bonafides. Or consider William Kristol, a Fox News contributor, founding editor of one of America’s most important journals, The Weekly Standard, and son of renowned Jewish intellectual Irving Kristol. Bill Kristol was one of Palin’s earliest supporters, and remains so. Lieberman, Kristol, Lipsky, and the Podhoretzs are sophisticated, educated, thinking Jews who appreciate Palin’s heartfelt support for Israel, her forceful and informed advocacy for energy independence, her strong stance on national security, and her fealty to traditional moral values (sometimes we forget these are Jewish values, too!) 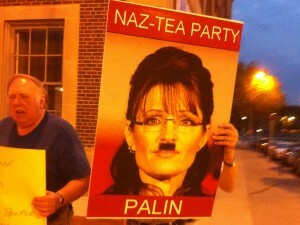 All are bellwethers of the increasing respect for Sarah Palin amongst us – the educated and affluent American Jews. Benyamin Korn, former executive editor of the Jewish Exponent, is director of Jewish Americans for Sarah Palin and JewsForSarah.com. He hosts “Jewish Independent Talk” every Sunday from 5 to 6 PM on WNTP News-Talk 990 AM in Philadelphia.